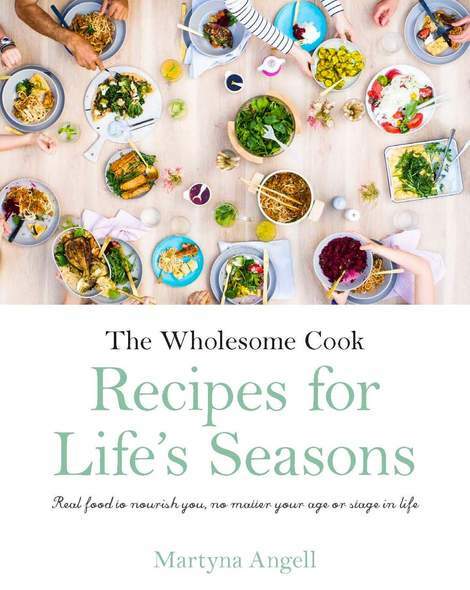 I admit, it’s a little rough around the edges, so it may look too scary to plonk into your shopping basket, but seeing how easy it is to cook with and how good it is for you, perhaps you should give it a go next time you go grocery shopping. I’m so glad I did. Today’s rendition of kale comes as a side, or stir-through topping for my Polish egg dumplings. I called them that because, frankly I don’t think anyone would understand what I was on about if I translated their Polish name into English directly: laid dumplings (kluski kladzione). Blank stare? Thought so. The name comes from the way in which spoonfuls of the dough are placed into a pot of boiling water, they are literally laid down off of the spoon. They don’t have much flavour on their own, although there is a fairly strong egg presence, hence my English name, that can be picked up by some. Otherwise, and generally, they are best served with meat stews, Bolognese sauce and a more runny version of creamy mushroom sauce. In summer they are great with crumbled farm cheese or quark and strawberries or cherry compote. But it’s winter here, our long weekend has been marred by a torrential downpour so this hazelnutty kale version seemed a lot more appropriate and was a delicious vegetarian lunch option that still satisfied. You can use a teaspoon or a tablespoon to lay your dumplings, the first will just require a little shorter to cook and longer to use up the batter. Feel free to use almonds, macadamias, pepitas or pinenuts instead or as well as the hazelnuts in the recipe. For a dairy-free option use good quality cooking oil instead of butter. Sift flour and baking powder into a medium bowl. Melt butter in another bowl. Add water and egg to the melted butter and whisk together. Add the mixture to the flour and mix vigorously with a wooden spoon for about 2 minutes, the dough will become smooth and elastic - in fact the longer you mix the batter, the fluffier your dumplings will be. Dip a tablespoon or a teaspoon in the boiling water, then scoop some of the dough onto the spoon and dip the whole thing into the pot of water again - the dumpling should come off the spoon and into the water. Repeat the process with another 5 or so and cook until they float, then for a further minute. Scoop dumplings out of the water and into a lightly greased bowl. Repeat until all dumplings have been cooked. Heat butter and oil in a medium fry pan over medium heat until melted. Add hazelnuts and cook for a further minute. Add egg dumplings and fry until golden brown on one side. 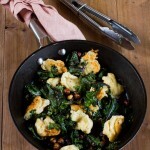 Add kale and stir through the dumplings and hazelnut butter. Cook until just lightly wilted. 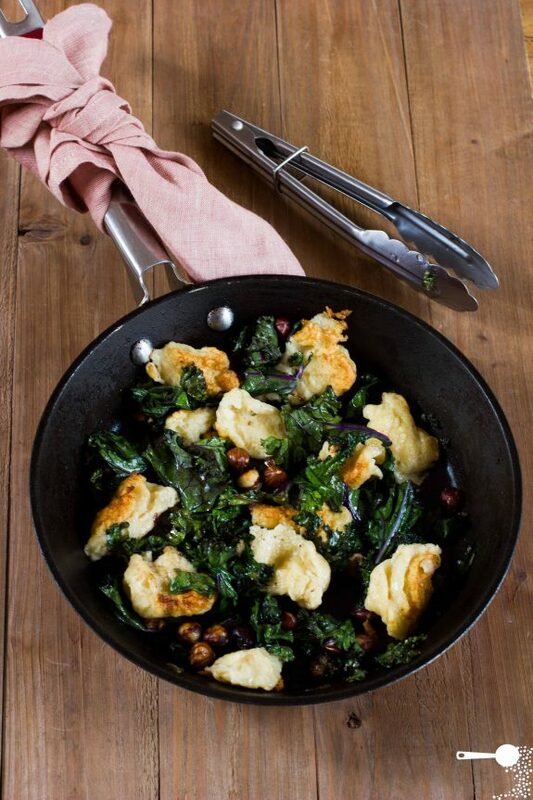 Divide dumplings and hazelnut kale between your serving plates. Sprinkle over with freshly ground pepper (and parmesan cheese, if serving). What a dish for the queen’s birthday 🙂 I think she would be pleased. I’ve got heaps of macadamias so I might give this a try. It looks great. Oh it is such a dumpling day in Sydney today isn’t it!! Perfect recipe and one I must try. Do know that I am actually keep all your post (via email) into a dedicated folder of recipes! AM definitely going to use them when I have my kitchen back end of this year!! Oh yay! I’m pleased to hear that! 🙂 Are you renovating? Nope, ain’t got enough moolah to own one yet. the property market here is crazy. I am also like that when I am fond of something I kept on repeating the ingredient over and over again. This is so easy to make and I still have a bag of kale. I’ve never tried egg dumplings cooked like this, but heard about this polish egg dumplings and I’m interested to give this a try. I happen to have everything! Does your food ever turn out ugly? I highly doubt it. Everything always looks so amazing! Haha! Sometimes… That’s why I only post 3 times a week? I adore kale as well and try to do enough different things that I only sometimes get a ‘kale, again?’ comment these days! Will be adding this to the list 😉 With all this cold weather I’ve been in the mood for dumplings but didn’t know where to start, thanks! I am all over kale at the moment. On this rainy night, this dumpling dish is perfect for dinner. I’m craving it! It looks so original! Frankly I think this is one of the rare Polish dishes I have never tasted (although I know how these are made: the name says everything 😉 ). You have made a wonderful creation out of the humble dumplings. Oh, my. Can’t think of anything really clever to say. Just: That looks so very, very good!